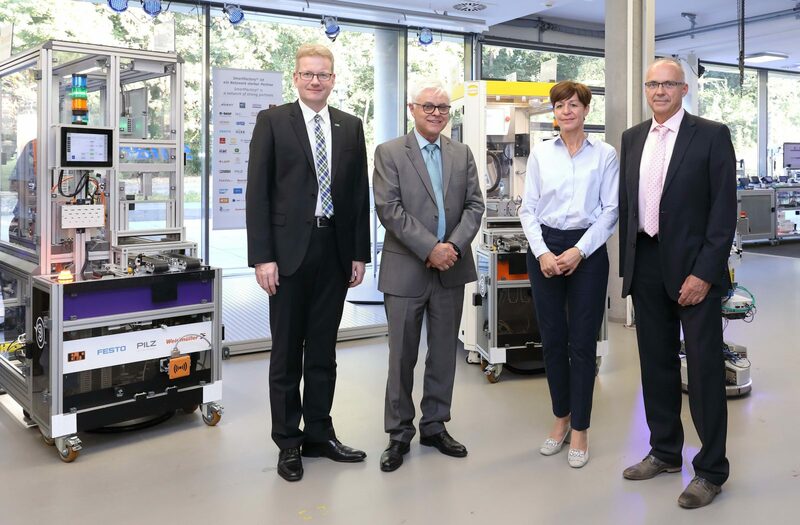 About 70 invited guests representing politics, business, and research convened under the motto “Industrie 4.0 in Practice – Users report.”“In recent years, we have successfully brought the concept of Industrie 4.0 from scientific research to practical application in Germany,” said Prof. Dr. Detlef Zühlke, CEO of SmartFactoryKL, in introducing the 10th Innovation Day. Over the past several years, the association has observed a shift in the nature of the inquiries from manufacturing firms looking for new products for the Industrie 4.0 environment, to users who require support in their digital transformation. This was reason enough for SmartFactoryKL to organize an event to share the recent experiences of three of our member companies. The keynote address was delivered by Dr. Olaf Abel, Vice President Electrical & Instrumentation at BASF SE in Ludwigshafen. He reported on the international aspects of the Industry 4.0 implementation at the chemical company, a founding member of SmartFactoryKL. Various BASF divisions and units have been involved in this for quite some time. “The chemical industry is also managing a digital transformation. We want to use digital technologies to create added value for our customers. We see, especially in the area of production, numerous opportunities to further increase our plant availability and our productivity in order to improve our efficiency and effectiveness,” said Abel. Click on the screenshot below to load the content of YouTube.